Last year the State purchased approximately 50 thousand acres of land in the headwaters of the Yakima Basin from a private timber company with the intent of creating the Teanaway Community Forest. The stated goals include preserving working forest lands and enhancing recreational opportunities. The Washington State Department of Natural Resources has been tasked with the management of this large new piece of public land. To help guide the State in implementing this plan a citizen advisory committee was formed. There are 20 members on the advisory committee, but the DNR allowed only one person to represent motorized recreation. Fortunately that one person is getting the full support of the Northwest Motorcycle Association and the Washington Off Highway Vehicle Alliance, but with the deck stacked against off highway vehicle enthusiasts it is imperative that they get more involved or they will lose out on this excellent riding area opportunity. The DNR has a legal requirement to allow multiple uses of the land when it does not compromise their trust management obligations. ORV use has historically proven to be one of the most compatible uses within working forests and as such should be prioritized accordingly. Even prior to this community forest legislation, the DNR has been directed by RCW79.10 to facilitate multi-use public access whenever it is compatible with their trust obligations. 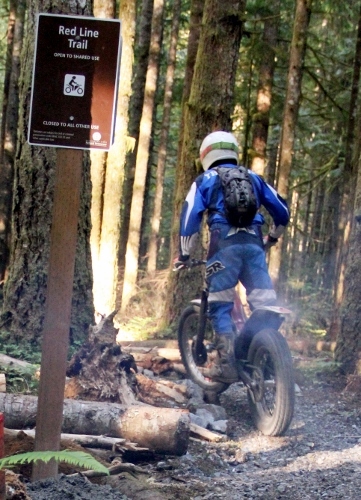 Although its legal status has varied throughout the years and landowners, the Teanaway Forest has a rich history of offroad motorcycle use ever since there have been motorcycles capable of taking to the trails. Combine this history of use, the wide variety of terrain, the scenic splendor of the area and it is not hard to see how important it is to promote and protect this offroad riding asset. Follow this link to view a nice collection of videos that show the type of riding and outdoor beauty that can be found in the Teanaway Forest. The DNR is continuing to collect comments on how the Teanaway Forest should be managed. The next step is to contact your State Senator and both of your State House of Representative members and let them know that ORV trails in the Teanaway Community Forest are important to you and an appropriate use of the public forest lands. For more information on how you can help save the Teanaway Forest and other ORV issues, go to www.nmaoffroad.org and www.wohva.org. See how you can join us in the battle to protect our right to recreate on public land.